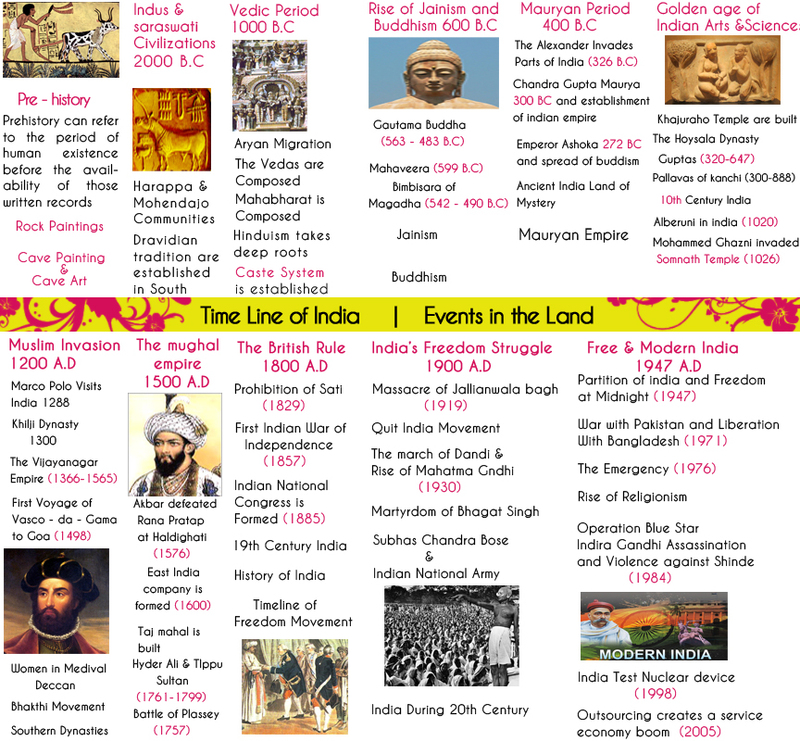 Ancient India TimelineThe time line of ancient India dates back to 5000 BC. The artefacts found dating back such period suggests human habitation in India even before that timeline. Mehrgarh one of the most important Neolithic sites on the "Kachi plain" in Balochistan, Pakistan gives evidences of human settlement around 4300 BC. The Aryans, the nomadic people from central Asia and the Russian steppes entered India through north-west region around 1500 BC. This marks the beginning of the Vedic Period in India. 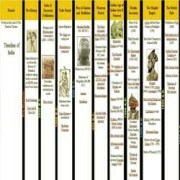 There are two phases of the Vedic period, the early Vedic period 1500 BC to 1000 BC and the later Vedic period from 1000 to 600 BC. The Upanishads The Rig Veda written around 1000 BC for the first time mentions the god Rudra (Shiva). It’s around 600 BC Vedic scholars codify and reinterpret Aryan beliefs to create the Upanishads, that became the basis of Hinduism establishing deep roots in India. The caste system develops from 600 to 400 BC and the Brahman priests occupy the top status. Since then Hinduism became very ritualistic and sacrificial. After that period of time, the Puranas, Mahabharata, and Ramayana were written. The Ramayama was composed in 300 BC, the Mahabarata in 200 BC. While in north India Aryan traditions was being developed, in south India from 1000 BC - 600 BC, Dravidian traditions were being established, separately, without any Vedic connect. The Chola dynasty ruled over southern India with capital in Thanjavur during 300 BC. The Aryans expand into the Ganges valley in 700 BC. It was around 600 BC Indo-Aryans ruled over 16 mahajanapadas (great states) from the Indus region to the Ganges. Vardhamana Mahavir, founded Jainism, a form of religious belief system in 500 BC. Siddhartha Gautama Buddha who lived around 563 -483 BC founded another religion called Buddhism. Alexander led campaignsCyrus the Great, founder of the Persian Achaemenid Empire conquers north-western parts of the Indian subcontinent in 538 BC. 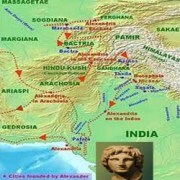 Alexander led campaigns in northern India in 326 BC. Porus who ruled parts of the Punjab, fought Alexander at the Battle of the Hydaspes River. The establishment of the Indo-Greek kingdom took place in 180 BC. The Indo-Scythian kingdom was established in 80 BC. Vikramaditya established Vikram era in 57 BC, as a commemoration of his victory upon the Shaks. Chandragupta Maurya seized the throne of Magadh and expands the kingdom over northern and central India in 298 BC. He dies in 272 BC. Chandragupta's son, Bindusara, rules and expands the Maurya Empire from 273 BC. The kingdom of Magadha, ruled by Bimbisara, was the most powerful state in India. The grandson of Chandragupta Maurya, Ashoka, becomes the emperor of the Maurya dynasty in 260 BC.. Ashoka conquers the kingdom of Kalinga 232 BC and scene of the destruction in the war makes him convert to Buddhism and after that he propagates its gospel. Following his death in 200 BC, the Maurya Empire declines. Chinese traveller Fa-HienSri Gupta I founded the Gupta dynasty in 240 AD with its capital in Patliputra. This dynasty flourished for next 600 years. Chandragupta I ascends the Gupta thronein 320 AD. He was followed by Samudragupta who ascends the throne in 335. Samudragupta's son Chandragupta II, becomes the Emperor in 380 AD who reigned till 450 AD. 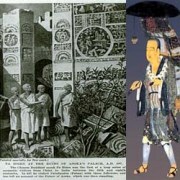 Chinese traveler Fa-Hien visited India in 400 AD during the time of Chandra Gupta II’s rule. Harshavardhan, a Buddhist was crowned monarch in 606 with its capital Kanuj. He ruled for 42 years. He was a literary figure and a military genius. Chinese traveller Hiuen-Tsang visited India from 630-643 AD during Harshavardhan’s rule. In south India, the Chalukya of Badami was at its peak of power during 637 AD. Its ruler Pulakeshin II pushes north up to the Narmada and defeated Harshavardhana of Kanauj in 647 AD. The Pallavas dynasty in south India gained prominence after the eclipse of the Satavahana dynasty. With its capital at Kanchipuram, Pallavas ruled regions of northern Tamil Nadu and southern Andhra Pradesh. They build a new city at Mamallapuram in 670 AD where they constructed the Shore temple in 700 AD. In 846 AD, the Cholas regained independence from the Pallavas. The absence of any central authority from, the 7th to the 11th century, led to power struggle in the different regions of the country. India was divided into many kingdoms and principality and there was continuous war to expand the territories. The ancient Indian time line continued to flourish till the 11th century even as Muslims from north of India, started making inroads. This started with Muhammad Bin Qasim victory over Raja Dahir in 712 and was followed by the raids of Mahmud of Ghazni of north India. It was 1192 AD when Shahabuddin Gorhi, defeated Prithvi Raj Chauhan, at the first battle of Panipat to establish a Muslim sultanate at Delhi.